Discoverers is a group for 10 to 16 year olds and it spans the three churches in the United Benefice. We currently meet together twice a month during school term time from 5.00-6.30pm in The Canterbury Room of St Thomas' Church in Goring. Check the calendar for exact dates. 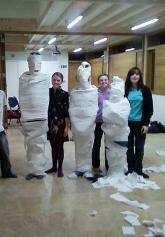 Our main thing is having fun whilst finding out about being a Christian. We like talking together about what we think. Sometimes we do mammoth things, such as, doing a 12 hour musical marathon to fund-raise for charity. But mostly our group is about playing messing-about games, quizzes, crafts, and occasionally a bit of baking (that's usually something chocolatey)! We have been known to take over and run a whole church service. At the end of term we like a party, a filmshow and pizza, or an outing - ten pin bowling. Anyone, living in the area, who doesn't come along is really missing out! Contact Steve Johnson via the web editor. There is strict adherence to the Diocesan Child Protection policy in the Benefice of Goring, Streatley and South Stoke. Every volunteer who works with children is DBS checked. If anyone has any concerns please speak to Judy Crawford or email the Ministry Team in the first instance.